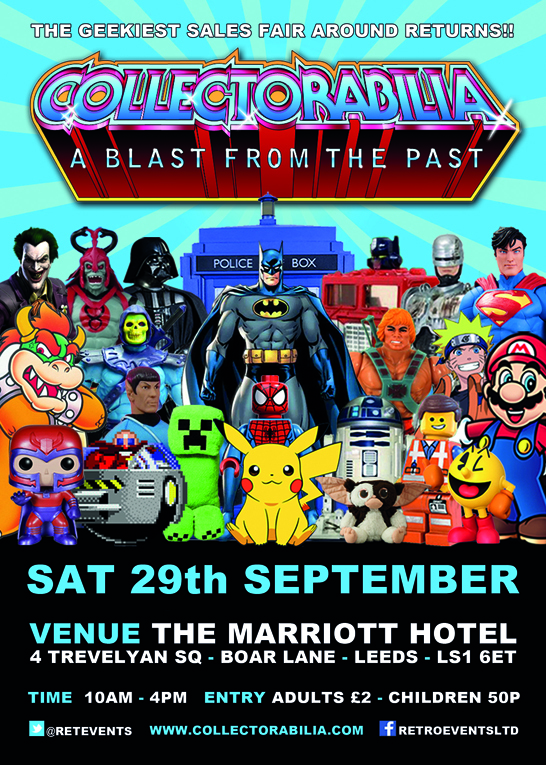 The COLLECTORABILIA returns for our biggest ever event!! 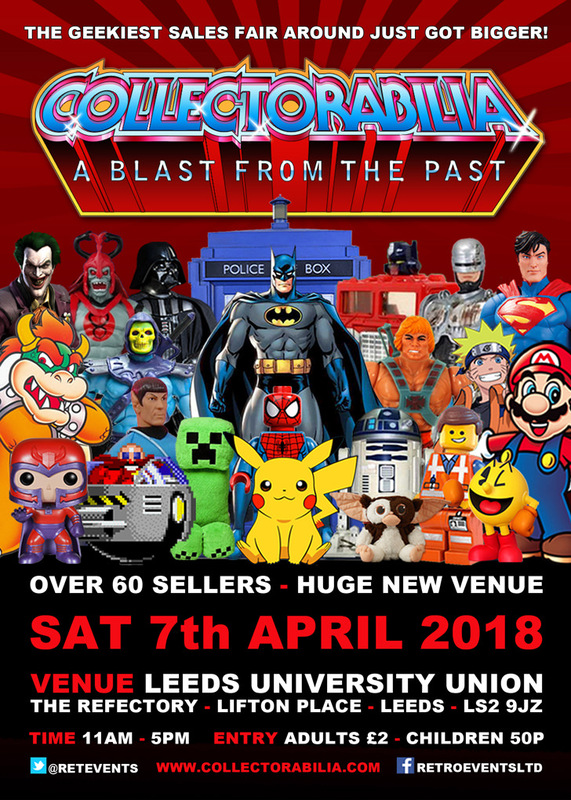 The geekiest and most diverse sales fair around is taking over the huge Refectory venue at Leeds University - giving you the chance to get some amazing one of a kind items from yesteryear and also the collectables of today! 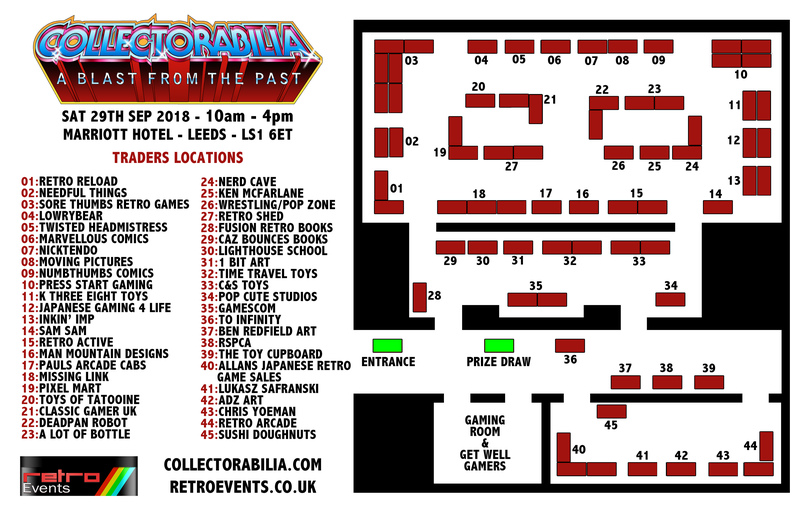 There will be a huge range of retro games, consoles, toys, action figures, comics, graphic novels, art, craft, Lego, bartop arcades, modern collectables, funko pops, t-shirts, wrestling merchandise, Pokemon, Transformers, japanese imports and much much more!! The bigger venue means more sellers, more items to buy and more deals to be done! Whether you collect old school Star Wars, 80's/90's memorabilia or modern pop culture there is something for everyone - big kids and little kids alike! The Sentinel Squad UK are also making a comeback, so join in with Darth Vader and the gang to help raise money for charity and get your photos taken with them. The Collectorabilia is a cosplay and family friendly event. 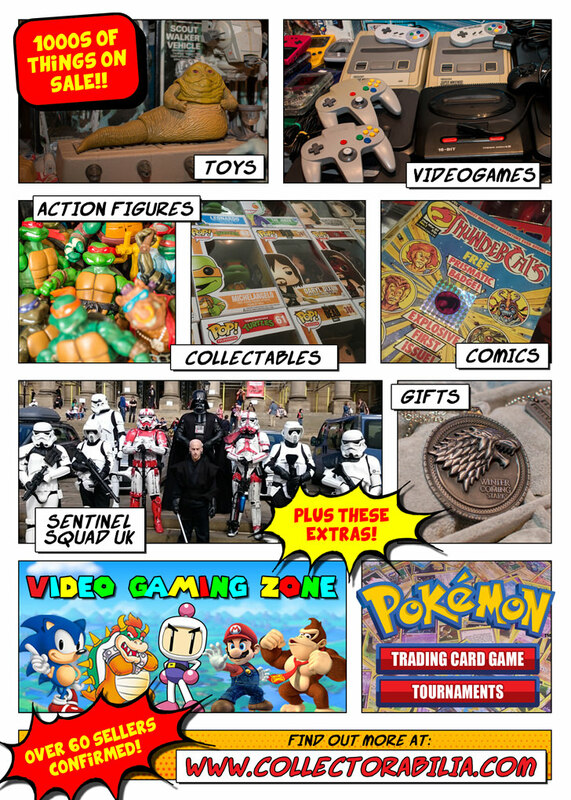 There will also be classic video games to play and also a Pokemon Trading Card Game area and tournaments to enter! sellers map for the collectorabilia - Sat 7th April - Leeds University - 11am - 5pm - also plenty of other attractions too! 75 sellers of the best in old and new covering: retro games, consoles, toys, action figures, comics, graphic novels, art, geeky merchandise, Star Wars, Lego, Pokemon, cosplay, anime, Transformers and soooo much more!! The Sentinel Squad UK return so come and get your photos with your favourite characters from the Star Wars universe. There will be a gaming section to play on some classic videogames! Pokemon Trading Card Game area with tournaments to enter too!! And… the first 50 people through the door will get a goody bag too! The SUPER Retro Games Fair is back for its biggest event yet! There will be retro games to play, tournaments to enter a bar and cafe too! The Play Expo's going to be at Braehead again in a few weeks - the 9th & 10th of June. The Geekiest sales fair returns! 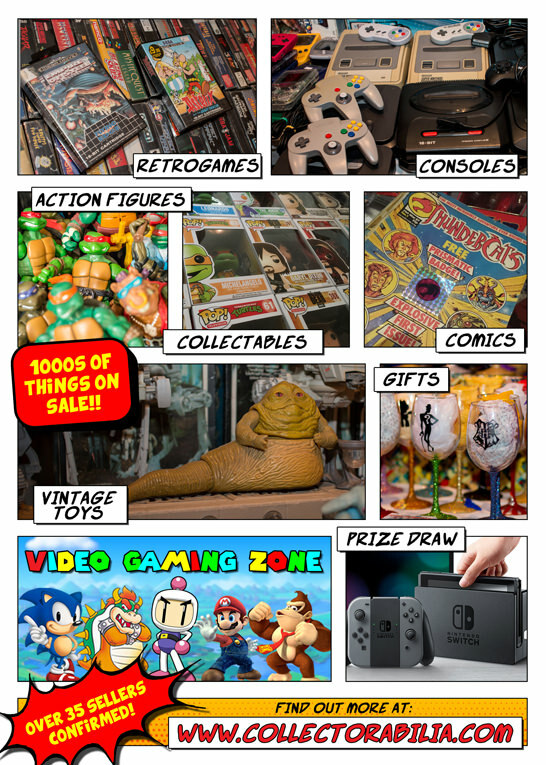 With over 35 sellers of the best of: Retro Video Games, Consoles, vintage toys, action figures, Star Wars, He Man, Comics, graphic novels, Lego, Geek Culture, Pixel Bead Art, Funko Pops, original artwork, t-shirts and much more on sale there is something for every collector! This is the perfect event to get those great additions to your collection, buy back your childhood, discover new things or start a new collection. As well as the stalls there will be some classic video games to play also in our gaming room. https://www.facebook.com/RetroEventsLtd and check out our other events coming up too! Tell us you are coming on the facebook event page: https://www.facebook.com/events/127201714796590/ and keeping checking on there for updates on the event! Come along and join in the fun and get some great stuff for the collection too!! Not long left until the Collectorabilia now - Here is the list and locations of all of the sellers for the event! Is there anything coming up soon in the London area (or the south east in general) worth visiting? First big name guest - Matthew Smith ! They'd better have some sort of massive Star Wars thing going on!!!! Good shout ! Didnt realise it was that day ! Thats the big question will he turn up.